Vancouver-based Dan Mangan has been plying his singer-songwriter trade for some time now. Releasing his first full-length Postcards & Daydreaming in 2005, it wasn’t until 2009’s Nice, Nice, Very Nice (a title taken from Kurt Vonnegut’s Cat’s Cradle) that his melancholic music reached a wider audience. With a sideline in writing for The Guardian and Huffington Post, Mangan has a neat way with words . His latest release, Club Meds, is the first to give equal billing to his backing band Blacksmith, and a fine move it is too. Blacksmith, the three- (or sometimes four-, five- or six-) piece band, provide a wall of noise that is both bombastic and intricate, with a particular highlight being a heavily distorted trumpet backing. The album also benefits from being a slow-burner, taking a couple of listens to get into it’s dark nature and Mangan’s thoughtful lyricism. You can check out the great video for ‘Vessel’ below. Dan Mangan + Blacksmith will be playing Bristol’s Thekla in April. 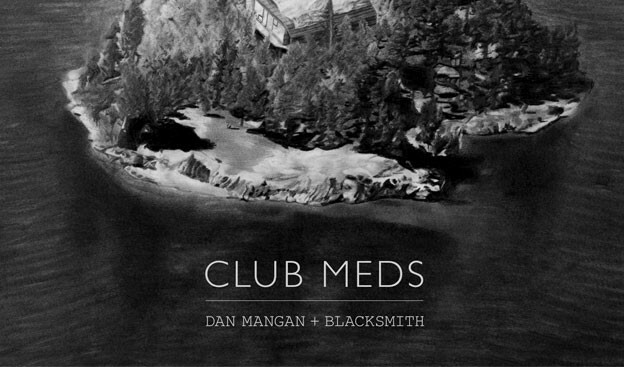 Tagged artist of the week, blacksmith, club meds, dan mangan, Thekla. Bookmark the permalink.